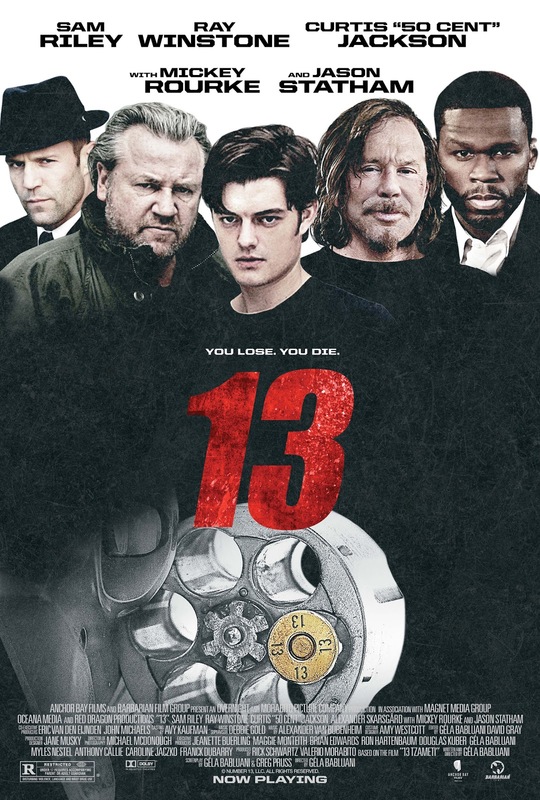 On behalf of Anchor Bay Films, here's your reminder that the action-thriller film 13, starring Jason Statham, Sam Riley, Curtis "50 Cent" Jackson, Ray Winstone, Alexander Skarsgard, and Mickey Rourke, opens in select theaters in New York City and Los Angeles today for an Exclusive Theatrical Engagement!. I've seen this awesome flick so go and check it out if you get a chance and dig on the new theatrical poster up top! Vince Ferro is a man in desperate circumstances. While on a quick fix-it job, he steals an envelope containing instructions for a mysterious job that promises a potential fortune. He assumes a false identity and follows the instructions, only to find himself a numbered participant in an underworld Russian roulette competition, where gamblers place bets on who'll survive when the trigger is pulled. The stakes are high, but the payout is more than he can resist. Many are competing for the first time, and a precious few have even returned to play again, but are his odds any better than other players in this most deadly game? What will it take to be the last man standing?